Long ago, Marcus Gray, the Marquess of Haversham, left the Home Office with a blackened reputation and a determination to never look back. He skirted the edges of London society, caring for little other than himself, until he crossed paths with Caroline Staveley. When Marc discovers the recently widowed Caroline has returned to London and her late husband’s actions have placed her in danger, he is quickly lured into the once familiar game of cat and mouse he thought he’d escaped. Caroline, Viscountess Staveley, is struggling to raise her children and find her place in the world now that her steady and reliable husband is gone. The last thing she needs is another complication, and that is exactly what the notorious skirt-chasing Haversham is—a complicated, unapologetic rake that tempts her like no one ever has. As she starts to unravel his secrets, however, she begins to wonder who he really is and exactly how many secrets he's keeping. A book with Passion and Intrigue! This is actually a 4.5 star. I loved the story of Caroline and Marc, how he has been in love with her all this time. Caroline is adjusting to her feelings for Marc after her marriage to David as well as going through the trials of motherhood to a teenage daughter about to come-out. The story has intrigue as well as passion. The reason I couldn't give it 5 stars, I've only read 1 of the previous books in the Scandal series and I kept getting confused with all the past characters by not knowing their stories as well. I was still able to keep Caroline and Marc's story in the forefront, so I was able to concentrate on them for the most part. I'm hoping Rachel does have a story coming up soon! I won the ARC for this book and promised a true review! He has always loved her. Caroline really thinks she hates Marc, but Marc has loved Caroline for a long time. Marc isn't ready to risk another person's life by getting involved, but he can't resist Caroline. Society sees Marc in one way and Caroline is finding out that things aren't always what they seem. Can she get through the layers that Marc has used for insulation from the world to get to the real person? Caroline, Viscountess Stavely, blames him for her beloved husband’s death and wants nothing to do with him. When her husband’s past threatens her can she overlook her hate and allow him to protect her and her children? If she does, who will protect her heart? The only woman he’s ever loved hates him with every fiber of her being, so how can Marcus Gray, Marquess Haversham, protect her when her husband’s secrets threaten her? Can he do it from a distance and protect his heart or will he have to become personally involved in her life and risk it all? 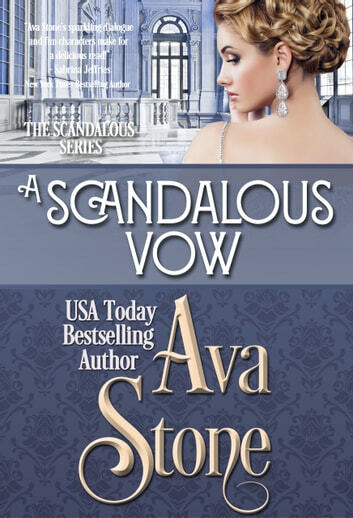 Ava Stone ends her Scandalous Series with this well written tale of secrets, danger, and a precocious sixteen year old that will give any mother gray hairs! An exciting story for Marcus full of passion and mystery. A former spy and rogue to boot, Marcus Gray, the Marques of Haversham is being blamed by Lady Caroline Straveley for the death of her husband. Marcus has began to have feelings for Caroline and she him but still she also feels loathing for Marc. There's danger and intrigue in this instalment to the "Scandalous" series. The emotions that fly between the heroes are breathtaking and the plot is a story well written. A very enjoyable read and I highly recommend it! FINAL DECISION: I loved this book because these characters were so mature in their relationship which was based on intelligence and genuine liking for one another. While the two have a stormy past, their relationship was an intelligent pairing of people who talk to one another. THE STORY: Marcus Gray, Marquess of Haversham, has been in love with Lady Caroline Staveley for years. For most of those years, however, she was married. Now a widow, Caroline spends her time raising her children. When Marcus discovers that Caroline has become the focus of an inquiry by the Home Office to find a code book being deciphered by her deceased husband, Marcus springs into action to find the book and protect Caroline. His search, however, brings Marcus into repeated contact with Caroline as the two discover the passion that is allowed for the first time. At the same time danger surrounds the couple as various interests search for the code book. OPINION: I loved this book because of the heart involved. The torch that Marcus has carried for Caroline feels like it has been a force for good. It has made him a better person as he knows that he can never have Caroline but has concentrated on being her friend. (As an aside, the two have a somewhat rocky history when Marcus kissed her once, but not having read most of the prior books in the series, I only am reviewing what I read in this book). Caroline is a mature woman who has been married for half her life. The mother of three, she had a very good marriage (what a relief from the "horrible first husband" stories that are so common). I loved watching her balance her personal desires and her need to be a good parent to her children. With four children between them, the kids are not just props but an important part of the relationship between Marcus and Caroline. Marcus is a man with a dangerous past that costs him his relationships with those he loves. I really felt that Caroline freed Marcus from a past that trapped him from truly being the good man he is. Always pretending to be worse than he is, having to deny those he loves. My heart hurt for him. His willingness to do anything for Caroline and his insistence to her daughter that he will not lie to Caroline was mature and I ended up liking him so much. While this book has some action with spies and danger and thieves, what I loved most about this book was its quiet mature heart that is the love shared between Marcus and Caroline. This book really made me buy the rest of the series. WORTH MENTIONING: I'm now waiting impatiently for Rachel and the Covent Guard! 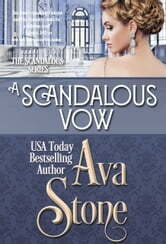 CONNECTED BOOKS: A SCANDALOUS VOW is the seventh book in the Scandalous Series. There are many appearances by characters from the series and while this book is understandable without knowing about the prior books, it was difficult for me to sort out everyone. STAR RATING: I give this book 4.5 stars. NOTE: I received an ARC from the author in order to write a review. I was not required to write a review or a positive review. All opinions contained herein are my own.